VARO, Goodfuels expand agreement. Image Credit: Goodfuels. VARO Energy will help expand the supply of GoodFuels’ bio-bunkers to deep sea vessels as part on an expanded partnership between the two companies. The new agreement will see VARO help scale the sourcing, production, blending, and distribution of GoodFuels Bio Fuel Oil across the ARA region. GoodFuels will continue to focus on the sourcing of sustainable feedstocks for the Bio Fuel Oil, and the sale, marketing and product development of new sustainable fuel solutions. 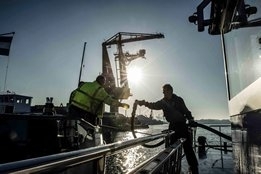 The pair already have an agreement, made last year via VARO Energy subsidiary Reinplus Fiwado Bunker, to supply the biofuel at at the port of Rotterdam and along inland shipping routes in the Netherlands through the Reinplus Fiwado Bunker's network. "Due to upcoming IMO spec changes and stricter emission requirements, the demand for alternative shipping fuels is increasing," said Ben van Kol, Managing Director of REINPLUS FIWADO Bunker. "We are proud to now also provide sustainable biofuels to deep sea clients, alongside our inland shipping customers, through the collaboration between GoodFuels and our parent company VARO Energy."